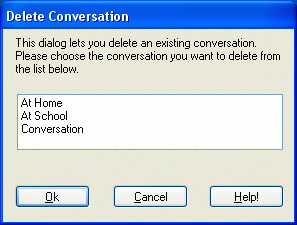 If you have more than one conversation you have created, you can delete any one with the Conversations|Delete option. This option will be grayed if you only have one conversation created. To delete a conversation from this dialog, select it with the mouse or keyboard, then press Enter or click on OK. Click Cancel to skip deleting a conversation.